UPDATE (5/19/09): Congratulations to subscriber Reyna of Philadelphia, who is the randomly selected winner of the giveaway! UPDATE (5/12/09): Several readers who wanted to enter were concerned about posting their email addresses. To make it easier to enter, all email subscribers and Google blog followers who haven't previously won a Giveaway are eligible to win. If you're not currently subscribing through email or following the blog through a Google account, simply do so and you'll be entered. You can earn additional entries through the methods described below. In my March post about gluten-free foods for Passover, I mentioned the delicious Shabtai Gourmet cookies and cakes made by Cinderella Sweets. 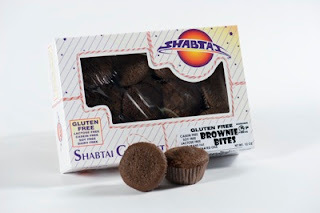 Shabtai Gourmet is a bakery line specializing in gluten-free, lactose-free, soy-free, casein-free and dairy-free cakes and cookies made in a dedicated facility. The products also are Kosher-Pa rve (dairy-free). At Passover, we enjoyed the Raspberry Roll and Brownie Bites, as well as our family favorites: the Rainbow Cookie Squares and the Seven Layer Cake. Through its website, Shabtai offers free shipping on all orders in the continental United States. 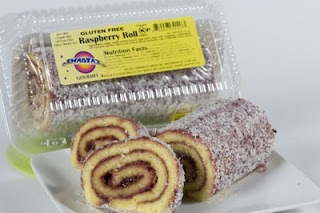 Locall y, the bakery's products can be found, among other locations, at ShopRite markets in Cherry Hill and Marlton, New Jersey. Now, you can enjoy some of these awesome goodies for free! Cinderella Sweets has graciously agreed to send the winner of the giveaway $75 worth of Shabtai Gourmet products. Here are the details: the giveaway will run now through 11:59 PM EDT on Monday, May 18, 2009. I will announce the winner on an update to this post and will contact him or her to get the shipping address and phone number for delivery confirmation - continental U.S. residents only and no P.O. boxes, please. The winner's email address will be randomly selected using random.org - first address on the randomized list wins! Sorry, but so that others have an opportunity to win, prior winners of the Goodies Giveaway are not eligible for this one. If you've already tried Shabtai's cakes and cookies, tell me in a comment to this post which product is your favorite. If you haven't, check out their products here and let me know which one you'd most like to try. Unless you post your comment using a public profile with a link to your email address, your comment must include your email address (post it in the format "name [at] domain [dot] zzz" to avoid spammers - for example, "gfphilly [at] gmail [dot] com"). Sign up to follow my blog or subscribe to email updates. Unless you've previously won a Giveaway, current followers and email subscribers also are eligible to win. Whether you're a current or new follower/subscriber, add a comment to this post with your email address to let me know you want to be in the running. Create a link to this post on your own blog letting others know about the giveaway. Be sure to comment here with a link to your post. Post a comment to another post on the blog with your email address listed if not otherwise accessible. I'm a new subscriber and would love to be in the running for the give-away. Thanks. Would like to enter the giveaway! Am a celiac living outside of Philly (my 7 yo daughter was also diagnosed at age 3) -- and have just found the GF "Ho Ho" alternative by Shabtai. Looking forward to future GF posts from Philly!